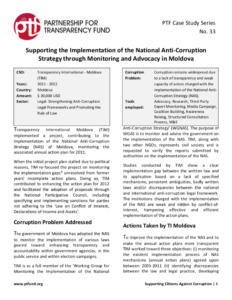 Transparency International Moldova (TIM) implemented a project, contributing to the implementation of the National Anti-Corruption Strategy (NAS) of Moldova, monitoring the associated annual action plan for 2011. When the initial project plan stalled due to political reasons, TIM re-focused the project on monitoring the implementation gaps* unresolved from former years’ incomplete action plans. Doing so, TIM contributed to enhancing the action plan for 2012 and facilitated the adoption of proposals through the National Participative Council, including specifying and implementing sanctions for parties not adhering to the ‘Law on Conflict of Interest, Declarations of Income and Assets’.